Ghosts, goblins and other creatures of the night will haunt Veterans’ Memorial Park on Saturday, Oct. 13, when the Boulder City Chamber of Commerce presents its annual Trunk or Treat. A family dressed up as scary clowns hoping to win the prize for the group costume contest during last year's Trunk or Treat celebration at Veterans' Memorial Park. This year's event will be held Oct. 13. A haunted house and haunted hayride join the traditional festivities, said Jill Rowland-Lagan, CEO of the chamber. According to Rowland-Lagan, the haunted hayride debuted last year and went so well they plan to expand it this year. It traveled through the tree-filled area near the splash park. Tom Devlin’s Monster Museum is bringing in the haunted house. 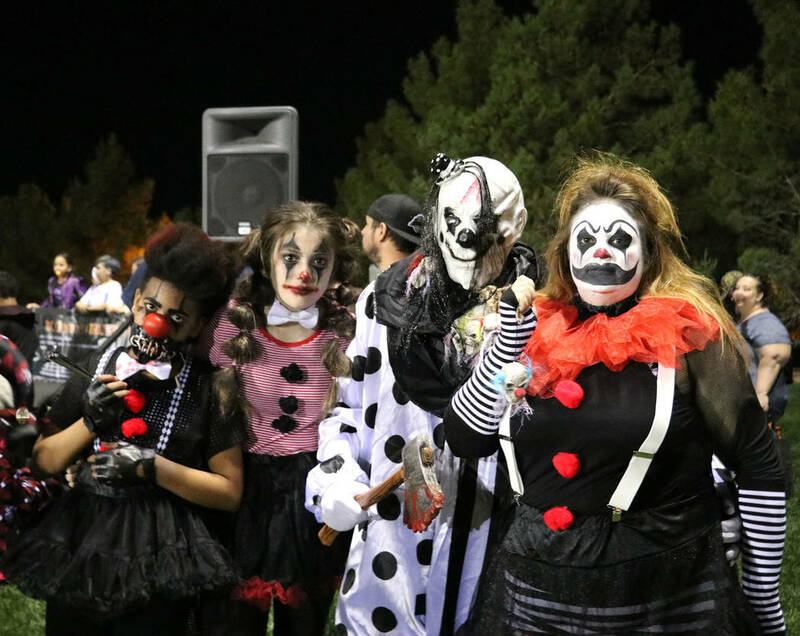 Presented by the Boulder City Chamber of Commerce, the event provides a safe environment for children to enjoy Halloween festivities, including trick or treating from decorated car trunks. Last year, about 400 cars came to the park for Trunk or Treat. Those who plan to participate in the trunk decorating contest and hand out candy will park around the grassy area of Pratte soccer field. That will allow the kids to safely go from car to car and stay on the sidewalk instead of going between vehicles, she said. This year’s event is earlier in the month because of conflicts with others for use of the park, Rowland-Lagan said, adding she thinks the change will be a good move. Even though it is being held on the same day as the wine walk downtown, which the chamber also sponsors, Rowland-Lagan said they have plenty of dedicated volunteers for both events. Gates to the parking area for the event will open at 3:30 p.m., with trunk or treating starting at 5 p.m. The costume contest will start at 6 p.m., when awards for the best decorated trunk also will be presented. Downtown Dental is sponsoring the trunk decorating contest and the Kendra Wright Agency returns as the costume contest sponsor. Admission is $10 per vehicle. “Shove as many people in the car as you can and come on over,” Rowland-Lagan said. Veterans’ Memorial Park is at 1650 Buchanan Blvd. Where: Veterans’ Memorial Park, 1650 Buchanan Blvd.